Los Angeles, CA, January 30, 2007: Bio-Logic Aqua Research Founder & Chairman, humanitarian and topical hydrotherapy pioneer Sharon F. Kleyne announced a landmark deal for her Grants Pass, Oregon based company making H&S Distributors their exclusive national sales and marketing representatives. H&S co-founders Lisa M. Hansen and Allen P. Hansen will serve as the National Account Managers for Bio-Logic Aqua Research's groundbreaking hydrotherapy products, with an initial focus on the all natural hydrotherapy eye care spray Nature's Tears® EyeMist®. Wisconsin-based H&S Distributors, under the leadership of Lisa M. Hansen and Allen P. Hansen, recently masterminded the breakthrough national sales campaign for the immune-boosting phenomenon Airborne. During the four years the Hansens shepherded the product, it exploded into the national consciousness, growing from grass-roots origins as a remedy created by a Northern California teacher to the leading herbal supplement in the cold/cough aisles of supermarkets, retail drugstores and mass merchant retailers across the country. H&S works with an expert team of nineteen brokers nationwide, placing products they represent in both bricks and mortar and online retailers including Walmart, Target, all major drug and grocery chains and Internet-based leaders including Amazon.com and drugstore.com. 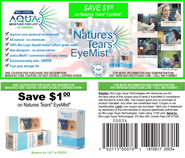 After learning of their success with Airborne, Sharon Kleyne approached the Hansens in late '06 regarding representation of Bio-Logic Aqua Research's Nature's Tears® EyeMist®. They were immediately taken with its uniqueness: "It's exciting and innovative - and simple to use," said Lisa, adding, "it doesn't duplicate or replace anything on the market, and as a chemical-free, all-natural product, it meshes perfectly with the tipping point we're seeing in the marketplace towards safer health and wellness alternatives." Allen noted, "We're also so impressed with Nature's Tears® EyeMist®'s unprecedented delivery system. The spray container is so convenient, and the fact that the unused water remains sterile is extraordinary." Bio-Logic Aqua Technologies, Inc. was co-founded in 1998 by Sharon F. Kleyne and her husband William Kleyne. The only company worldwide dedicated to researching all-natural water for pharmaceutical and medical uses, it grew out of Rogue Valley Natural Springs, founded by the Kleynes in 1989 when they discovered the restorative properties of its remarkably pure waters. Using source water from the Springs and made from Bio-Logic Aqua's proprietary sterile, tissue culture grade water, Nature's Tears® EyeMist® was born after users of Nature's Mist® Skin Water reported that their eyes felt as refreshed as their skin. The only eye care product to actually rehydrate the eye's tear film - as opposed to eye drop applications, which cannot penetrate the tear film - Nature's Tears® EyeMist® has been available on a limited basis since 2003. Bio-Logic Aqua Research is currently supporting a free online CE course - Tear Film And Treatment Of Dry Eye Disease - for pharmacists, primary care physician assistants and nurse practitioners at RxSchool.com. The course, available through August 2008, is conducted by tear film expert Dr. William D. Mathers, a Professor of Ophthalmology at Oregon Health and Science University in Portland, OR and a former consultant to Bio-Logic Aqua Research. Those completing the course with a passing grade will receive 1.5 course credit hours (0.15 CEUs); for details, log on to www.rxschool.com/outside/CE/dry_eyes.cfm. On January 30, Sharon Kleyne and the Bio-Logic Aqua Research medical advisory team held the inaugural session of the 2007 Bio-Logic Aqua Research International Symposium on Occupational Health and Eyesight Wellness Responsibility at the Beverly Hilton Hotel in Los Angeles, CA. The meeting previewed a year-long calendar of topics to educate people and raise awareness about emergent threats to occupational health and personal wellness, and to introduce new therapies for eyesight wellness. In addition to supporting Bio-Logic Aqua Research's ongoing commitment to understanding the medical benefits of the company's rare Bio-Logic Aqua® tissue-culture grade water and developing applications of it for the benefit of human health in an increasingly dry, polluted and stressful world, the Symposium will highlight pro-active regimens for individuals to counteract dehydration and improve their quality of life now. Among those in attendance were Lisa Hansen and Allen Hansen of H&S Distributors.